I have been following the story of Attila Ambrus since the mid 1990s, when a tiny blurb in The Hockey News alerted North Americans about a goaltender who was busted for robbing banks. Now the story has turned into a best selling book, and, from the sounds of it, a soon-to-be big budget Hollywood production, very possibly starring Johnny Depp. 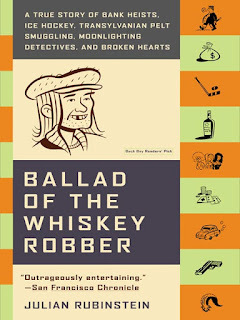 Ballad of the Whiskey Robber: A True Story of Bank Heists, Ice Hockey, and Broken Hearts was the literary debut for writer Julian Rubinstein, an acclaimed sports journalist. It went on to be one of the most acclaimed books of 2004. It is almost easy to forget that this is a non-fiction book. Ambrus' story is so outrageous and comical that it is almost tough to believe this is all really happened. And Rubinstein writes such an exquisite narrative that he really should be writing novels for Oprah. He's a fantastic writer. Ambrus is this charismatic but lost soul who was born in Transylvania, Romania but is very much a Hungarian at heart. That's important because the book has a lot of political undertones to it, serving both as a great history lesson and social awareness piece. He, like many Hungarians trapped in communist Romania, gets into a lot of trouble and flees to Hungary, which was no easy task. Finally "home," he finds out transition to fast-westernizing Hungary is no easy task. He takes on many odd jobs to survive, including church painter, pelt smuggler and grave digger. Oh, and professional hockey goalie. As terrible as he is at it, hockey is Ambrus great passion and escape. At the rink, and only at the rink, he can be at peace with himself. One problem though. He never plays. He's the back up netminder, which more or less means he does janitorial duties around the rink, including driving the Zamboni. To make ends meets he ends up robbing a post office in 1993. After this success, Ambrus continued a string of 27 robberies of banks, post offices, and travel agents that ended with his arrest in 1999, stealing in all about 200 million Hungarian Forints (about one million US Dollars). He was dubbed the Whiskey Robber because he would have to liquor himself up at a near by pub to get the courage to conduct another heist. Often victims would report the strong smell of whiskey on his breath. At the height of his fame Ambrus was the lead story in both the news and sports sections of Hungarian newspapers. For a small stretch, coinciding with the height of his criminal activity, Ambrus became the top goalie for his beloved UTE hockey team, although he floundered, once giving up 29 goals in a game. Ambrus became quite a legend in Hungary. A bit of a modern day Robin Hood because he believed this money, through his own lavish spending, was for the people, the antics he would pull were down right hilarious. He would often present flowers to the tellers that he held up. And he toyed with police, sending them gifts of alcohol. His daring charisma helped him become quite the dashing celebrity amongst the Hungarian population. In the eyes of many he was fighting the good fight against corrupt government masters. Upon his arrest in 1999, Hungarians were shocked to find out this UTE goaltender was the Whiskey Robber. He would later escape police custody, and continue to live in downtown Budapest for 3 months, before getting caught in another robbery attempt. He was convicted and sentenced to 17 years in a maximum security prison.